What's Impacting the ITSM Industry in the UK? In this current economic climate, what are the implications of new technologies such as cloud computing and virtulization for ITSM companies in the UK? Learn where to look for the top opportunities in the ITSM industry in the UK. This webcast is part of the Go for Growth Awards 2010, searching for UK growing service companies with the best growth plans. Enter directly by clicking on "apply" on the competition website here: www.go-for-growth.co.uk. Entrepreneurs and small business owners are used to “Pitching for money” from investors while at the same time often looking for a set of complementary skills to help grow the business. Modwenna Rees-Mogg, CEO of AngelNews has been connecting entrepreneurs and investors for many years and recognised the need that growing businesses also need complementary business skills to take them to the next level and so ‘Pitching for Management, Not Money' was born. Modwenna will share how the idea came about and the experiences and feedback from small business owners to date. Please note that this is a recording and will be available to view from this date. Questions, and voting are unavailable during the recorded webcast. All companies have some form of Intellectual Property, but awareness of what IP consists of, how you can protect it and how you can gain from investing in IP is very limited. This Webcast will help business leaders understand their own IP position better, and hopefully provide ideas on how to protect and monetise that IP. We will include the findings from a number of business case studies that Knowledge Peers have researched, together with the chance to ask an expert live and online about your own IP position". Adrian worked in private practice for several years before moving into the corporate patent department of a multinational pharmaceutical company, where he was employed as Senior Patent Counsel. In this role, he was responsible for providing IP support to five research and development facilities across Europe and in doing so, gained wide experience in managing all IP-related aspects of product development, from the initiation of development to launch. He joined W.P. Thompson & Co. in 2009, becoming a Partner in the same year. He is qualified as both a Chartered Patent Attorney and a European Patent Attorney. Adrian read Chemistry with Medicinal Chemistry at the University of Warwick, graduating with a BSc (Hons) and has lived and worked in Japan. Now is the time for companies to asses and understand how to strategically plan their capacity and their growth over a hesitant and uneasy economic recovery. Are you able to control your growth and manage your costs and profits as well as your competitors? Do you have processes in place that will support your next level of growth through perhaps, international expansion or a merger? Fintricity was the winner of the Go for Growth excellence awards for professional services for 2010. During this interview Alpesh Doshi will introduce Fintricity to the Go for Growth community, outline some the growth plans which attracted the judges attention and explain how the grand prize is further supporting Fintricity's growth plans. Meet the great companies that were selected as finalists as well as the overall winner of the Excellence Awards program for 2010. Attend this complimentary webcast as Fash Darabi of Knowledge Peers shares his conclusions from interviewing the managing partners of a number of successful professional services firms who are particularly good at finding and converting new clients. -Useful marketing activities which generate leads (and the ones which are a waste of money). Engage with Nigel Bacon, CEO of Secantor as they discuss the factors that are impacting business growth for professional services companies in the UK. Attend this complimentary webcast as Christian Happel of SAP shares his views on what social media means for your growing business. You will learn that social media is not only for your employees in the marketing functions, but can be applied to all functions of a business and how your business processes are affected by that. Prepare your questions and attend live so Christian can respond to you directly in this 45 minute webcast. If you are unable to attend live, you can also watch the recording afterwards at your convenience. The last couple of years have been tough and many have been forced to adapt to survive. Despite the credit crunch many businesses have thrived and they all share one thing in common…..they haven’t done it alone. Networking is a key tool in the success for any business, particularly when the going gets tough. Use it effectively and you can generate your own recovery. To do that you need to understand exactly what you need to achieve in your business and how your network can help. Labelled ‘Mr Network’ by The Sun, Andy Lopata was called ‘one of Europe’s leading business networking strategists’ by the Financial Times. The co-author of two books on networking, Andy is a featured columnist the US magazine ‘The National Networker’, as well as being regularly quoted in the national press. Previously, Andy was Managing Director of UK network Business Referral Exchange. Andy has since worked with companies from one-man bands to organisations such as NatWest Bank, Merrill Lynch and Mastercard to help them realise the full potential from their networking. He is a former vice-president of the Professional Speakers Association. The prize for the winner of the Go for Growth excellence awards is one year’s subscription to SAP Business ByDesign for up to 20 users. This webcast provides more information about SAP Business ByDesign and the Professional Services Starter Package which provides a fully integrated business management solution designed for midsize companies or small businesses that want the benefits of large-scale business applications without the need for a large IT infrastructure or spend. It enables preconfigured process best practices for managing financials, customer relationships, human resources, projects, and procurement. SAP takes care of installation, maintenance and upgrades – so you can focus on growing your business. Richard Alvin, Managing Director of Capital Business Media will be interviewing the CEO of Angel News, Modwenna Rees-Mogg as part of the Go for Growth competition. AngelNews is the leading European news service for the investment market, especially for business angels, investors and the companies they back. Due to rapid growth over the last few years and equally aggressive future plans they have decided to implement SAP Business ByDesign as their business platform to support their expansion. Engage live with Bill as he is interviewed by Marc Lawn on business growth for SMEs. Top tips for growth plans. Bill Liao, entrepreneur, philanthropist, diplomat and author, is a co-founder of the social network site XING and CEO of Finaxis AG, a privately held company in the financial services industry. Bill is a special diplomatic envoy for St Kitts and Nevis, with a special interest in sustainable development and the environment. He is also founder and co-ordinator of Neo.org, a global citizenship initiative, and WeForest.com, which will reforest twenty million square kilometres of stripped land. Bill is dedicated to the vision that business and enterprise, conducted fairly and with respect for the environment, can and will create a better environment for work, life and the world that we all share. This vision is captured in his book: Stone Soup; a Secret Recipe for Making Something from Nothing. Used effectively, social media can help to break down many of the business growth barriers facing SMEs. However, the key term here is ‘used effectively’. In the rush to become ‘cool and funky’, many SMEs have established social media channels without thinking strategically. What are our core business objectives for social media? How will we measure social media performance and ROI? Do we have the time and resource to fully support the channels we have established? What team do we need in place to manage our social media activities? The company judged to have the most innovative growth plan of all the finalists will also receive the opportunity to implement the SAP Business ByDesign Professional Services Starter Package. The Package is specially designed to give Professional Services companies a fast start and affordable access to the world-class business process management capabilities you need to compete and grow successfully. The 10 Go for Growth finalists will each receive an Enterprise Health Check. This is a unique opportunity, as the high value SAP Enterprise Health Check is not generally available to the public and is used exclusively with selected customers and prospects to assess current strengths, identify areas for improvement, and begin to quantify the business value associated with enterprise software applications. Watch this webcast to understand more about this highly valued prize. As markets develop and products mature customer needs can change. This is a fundamental area for businesses to get right, but how do I start and what are the things to watch out for? A simple beginners guide to help you on your way Marc is an experienced leader with a track record of delivering world class customer and consumer solutions on an international scale, having won three global accolades, he works with an ethical and sustainable stance. He pioneered the ‘making life easier’ management philosophy, one based on clarity, and has coined a ‘renaissance management’ theory, where senior leaders understand clearly the total context in which they operate. As a consultant to some key blue chip businesses Marc is adding value across the globe, he is a fellow of the RSA, a recent DBA graduate and a member of the IOD. His employment and assignment history covers middle and senior leadership roles in global organisations across multiple industries. Regular expert contributor to The Telegraph Business Club. Join the community and network, learn from experts and others SME owners on how to grow your business. 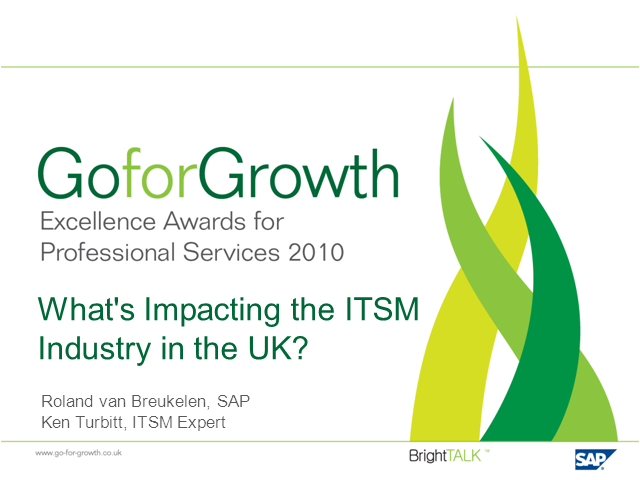 Title: What's Impacting the ITSM Industry in the UK?